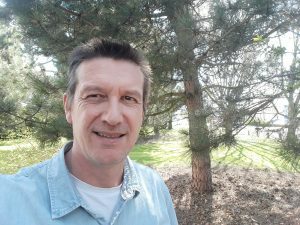 As part of my ‘places in the past’ series, guest author Glenn Bauer has written a fascinating post on why he writes about ancient Iberia. A couple of weeks ago, Jane kindly invited me to explain why I was motivated to write about Iberia. There was the obvious explanation of Iberia is where Hannibal Barca stepped into his father’s sandals, but that was not the whole reason or even a large part of it. Why Iberia? To help explain my motives, I should start with a very short summary of the Sons of Iberia series, which is of course set primarily in Iberia. 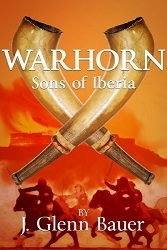 I self-published the first title, Warhorn – Sons of Iberia, in 2013 and the fourth will be available in the Spring of 2019. The series is set during the 2nd Punic War which was fought between Carthage and Rome between 218BC and 202BC. The central characters are native Iberians, the people who were caught between two empires, one old and mercantile, the other young and martial. You might know this war from tales of Hannibal Barca leading his elephants across the Alps, splitting great boulders with fire and vinegar, and the crushing defeats he inflicted on Rome. 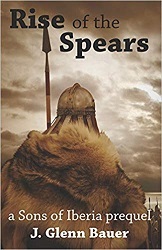 Fewer readers will know that this war was sparked by a minor conflict at the walls of an Iberian city made rich by trade and home to a large population of Greeks. This city was named Saguntum and exists now as Sagunto, a small town just a half hour’s drive to the north of modern-day Valencia. Today, a more recent castle complex guards the long hill on which Saguntum once stood. In exploring the history of Saguntum, known as Arse by the native Iberians, it becomes evident that the people of Iberia experienced successive waves of immigrants washing up on their eastern shore and migrating from north of the Pyrenees. From the diaspora of the people of Troy to the expansion of Phoenician trade colonies, there was an inexorable growth in interaction which benefited the Iberians and the newcomers. The Iberians of old, were tribal people and regrettably very little is known about them as they did not appear to have developed writing until after contact with Phoenicians and Greeks. What little we do know, is thanks in large part to the ancient historians Livy and Polybius who documented the 2nd Punic War. We know the Latinised names of the tribes such as the Bastetani (South East), the Turdetani (South) and Illergete (North East). Of all the tribes, the most enduring appear to be the Vascones whose principal town, Iruna, is the site of modern-day Pamplona. The Vascones appeared to have managed to thrive and expand and from them derive today’s Basque people. Modern archaeology has also contributed to our knowledge with unearthed ruins and artifacts that bare testimony to a people who valued art, built with stone and were talented metalsmiths. All this is grist to the mill for a writer and if you consider the dearth of contemporary English literature set in ancient Iberia, makes for a compelling reason to write a series of books set on the peninsula. While the ancient people of Iberia are long gone, their land remains largely unchanged and just as dramatic. The river Tagus which flows a thousand kilometers across Spain and Portugal to the Atlantic from its wellspring in the Fuente de García. The wild coast of the Costa Brava. 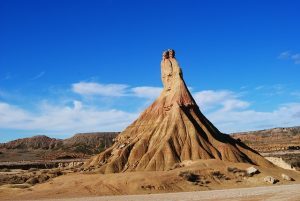 The moon-like Bardenas Reales. Interesting local settings are vital in creating depth and atmosphere in any tale and from the beautiful blue coastal waters of the Mediterranean to the high mountains of the Pyrenees, Iberia offers a palette of landscapes in which countless deeds of heroism wait to unfold. The varied Iberian landscape is complemented by an abundance of fauna and flora. Even today, centuries after the industrialization of farming, Portugal and Spain still boast many species that have gone extinct elsewhere in Europe. One such species is the Great Bustard, one of the heaviest flying birds alive and a species that was hunted to extinction in England, the last specimen being shot in 1832. A project to reintroduce Great Bustards to Wiltshire, England began in 2004 and in 2014, fifty-four fertilized eggs were imported from Spain which has the largest pool of these marvelous birds in Europe. 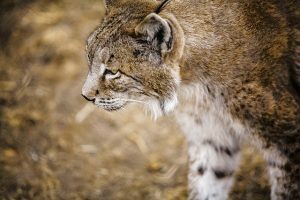 Other wonderful creatures that still roam the wilds of Iberia include the endangered Iberian lynx, brown bear, and Spanish Ibex. The Iberian lynx often features in Sons of Iberia and I begin the series through the eyes of a lynx. To experience nature such as the ancient Iberians might have, there are fortunately many incredible nature reserves and protected areas such as the Doñana National Park in southern Spain, a huge swathe of wetlands that offers sanctuary to hundreds of thousands of migratory birds. In conclusion, Iberia and its people were pivotal in the 2nd Punic War and yet so little is told of the Iberian people or how the war was fought there. For me, the opportunity to give a voice to an ancient people in the settings gifted by the Iberian Peninsula was one I could not decline.